In his Memos, Ives writes that his program notes read “the last movement is an apotheosis of the preceding content, in terms that have something to do with the reality of existence and its religious experience” (Ives 1972, 66). He then mentions that hymn melodies are quoted, which reminds me of the way Bach used chorale melodies in his cantatas. When listening to a recording of this movement, it sounds like a very dissonant jumble of sounds, and I wonder why Ives says that it is an apotheosis. Does is in some way bring back earlier themes? Or does he mean that in a metaphorical sense? Ives also mentions that the performing groups shouldn’t all be on the same stage in the second or fourth movements (Ives 1972, 67). I’m curious how this will work at the performance, whether the NY Phil will have ensembles in different parts of the hall, and how it will sound. Obviously you can’t capture the same sense of space on a recording, so it should sound quite different. There is also something very unusual about this piece: there’s a chorus singing in the first and last movements, which isn’t normal for a symphony since they are usually instrumental works. Additionally, the first movement is very short, and isn’t in sonata form. The third movement is slow, but the second and last movements are atypical too. Ives wrote this piece towards the end of his career as a composer, and it was his last symphony, so I think that it probably represents his mature style very well. He also says that he felt the most comfortable writing religious music in the fourth symphony (Ives 1972, 129), which is remarkable because he wrote a lot of church music, but a symphony is usually secular. Sources: Ives, Charles E. Memos. Edited by John Kirkpatrick. New York: W.W. Norton & Company, 1972. The above is a sample of the type of work I would expect from you regarding the biographical part of the preview. yes, how so? If no, why not? genre, the time period, the composer, the style. 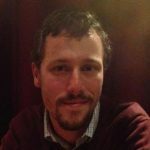 Add tags to your post, including the genre(s), composers, etc. This entry was posted in Concert Preview and tagged bernstein, ives, ny phil, rouse, symphony on March 20, 2013 by Jake Cohen. This entry was posted in Final Test Review on December 15, 2012 by Jake Cohen. In the mid-19th century, some of the modern European countries existed – countries like England, France, Spain, Holland, and Russia. However, much of the German-speaking world was split into large governing areas, each ruled over by a noble (a king, duke, prince, elector, or other title). Think of these lands like small states. However, unlike the United States for example, there was not a strong unifying government for all these independent regions. Italy, too, was an assemblage of city-states or small regions, each ruled by a local nobleman. In the map below, each region is outlined by a different color. Parts of Italy were under foreign control: France, Spain, and Austria all claimed governance over different parts of Italy. In additional, the Catholic Church (the Vatican) controlled a considerable portion of the peninsula, including Rome and the surrounding environs. 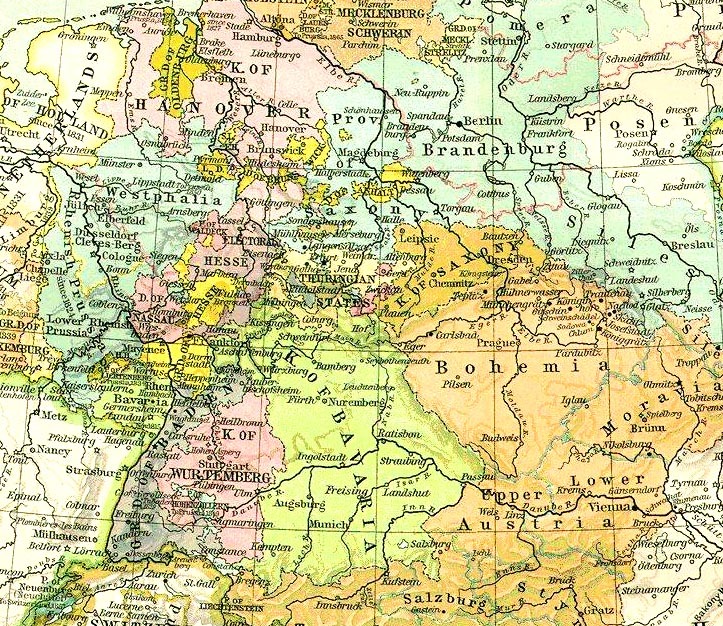 Now look at this map of German speaking lands from the same time period. Each of these colored regions represents a different political authority, and you can see some familiar names. In the Northeast, the province of Brandenburg (blue) included Berlin, in the South the Kingdom of Bavaria (green) included Munich. Leipzig was part of the Kingdom of Saxony, while Hamburg was in the Kingdom of Hanover in the north (pink). On the right side of this map, you can see a vast area in orange – this was the remainder of the Austro-Hungarian empire, ruled by the Hapsburg family for centuries. This empire included Upper and Lower Austria, parts of Hungary, Bohemia (modern-day Czech republic), Moravia, and Silesia. Although German was the official language of the empire, many of the geographic regions spoke their own languages, as many had been annexed into the empire, either by diplomacy or by force. 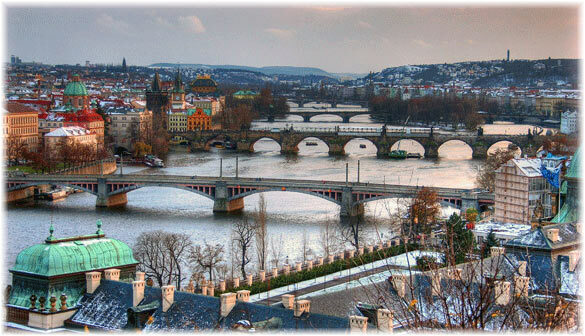 In Bohemia, whose capital was Prague, the native population spoke Czech. However, in the cosmopolitan city of Prague, German was the dominant language, and many middle class Bohemians of the 19th century likely grew up without learning Czech. 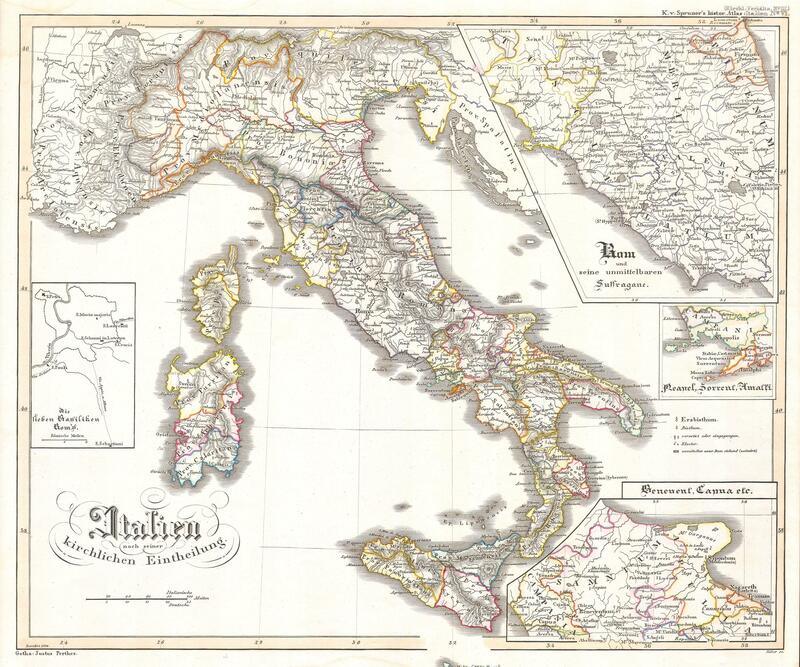 In Bohemia, parts of Germany, Italy, and elsewhere, a strong nationalist agenda formed in politics and art in the 19th century. This feeling was fueled by a longing for collective identity, and art, music, poetry and literature often adopted a nationalist aim. 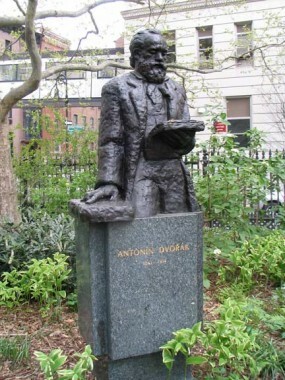 One of Smetana’s countrymen who followed his model of Czech nationalist composition was Antonin Dvořák (pronounced “D’vor-schak”). Like Smetana, he took Czech folk music as an inspiration. However, most often, Dvorak’s method involved composing an original melody using elements from Czech folk sources. These included melodies using the pentatonic scale, a five-pitch scale that is a common musical language in nearly all the world’s folk musics. Here’s the incredible vocalist Bobby McFerrin demonstrating just how natural it is for people of all different backgrounds to gravitate towards the pentatonic scale. Other devices that Dvorak used to lend a Czech flavor to his music are heavily syncopated rhythms and rhythms borrowed from Czech or Slavic folk dances, such as the polka, mazurka, spacirka, and sousedská (the last two are Bohemian dances). Additionally, Dvorak styled some of his slow movements after the Russian dumka, a slow dance movement that often moves from melancholy to exuberance. These contrasting sudden bursts of energy in an otherwise plaintive movement are characteristic of the dumka, and Dvorak employed them frequently. In 1892, Jeannette Thurber, the president of the National Conservatory of Music in America, offered Dvorak 25 times his salary at the Prague Conservatory to become the head of the New York City school. Dvorak took the offer and lived with part of his family in New York for three years, where he composed some of his most well-known works. Dvorak was brought over not only because he was a very famous European composer, but because he was a nationalist composer. The Americans hoped that Dvorak would be able to create an American nationalist musical voice as he had done with Czech music (never mind that Dvorak was obviously not an American!). You can hear a version of “Goin’ Home” with the newly composed lyrics by one of Dvorak’s students in the version sung by Paul Robeson below. Here, his deep bass voice brings an additional layer of gravitas to the melody. The ironic thing about Dvorak’s New World Symphony, as it became popularly known, is that many of the devices the composer used are not distinctly American at all. The pentatonic scale, as you saw in that Bobby McFerrin video, is common to practically all folk music cultures, and is certainly a strong aspect of Czech music. In fact, there is probably as much Czech national character in this symphony as there is American. Many believe that Dvorak wrote his famous Largo melody, the “Goin’ Home” melody, as a sort of homesick longing for his own country. Still, many in the American public and press believed that Dvorak’s symphony was precisely the American musical style they lacked. This work premiered in 1892 at the recently constructed Carnegie Hall, and was an instant hit. However, some in the musical press, especially in Boston, adopted a racist criticism of the symphony. Some white Americans were uncomfortable with a national style rooted in the music of Native Americans and African-Americans, believing them to be inferior styles of music. Dvorak’s legacy is important in America because he inspired many composers to follow his lead, writing music based on the folk music of the country (this ranged from Amy Beach’s Gaelic Symphony, written on an Irish theme, to Edward MacDowell’s “Indian” Suite, inspired by Native American music). But Dvorak was equally important as an inspiration for composers to think that there was a better way to write American music, that there might be a national style that wasn’t imported from Europe and taught by a Bohemian. This entry was posted in 19th Century, Romanticism and tagged czech, dvorak, nationalism, orchestral music, smetana, symphonic poem, symphony on November 18, 2012 by Jake Cohen. "Whoever this is, I cannot identify you because your name is not displaying as your full name." "Sorry, whoever this is, you did not format your entry correctly. It does not display with your name...Also, you don't have to list every single number from the opera! You can just write the name of the opera!!"